A couple days ago I read this post by Michele at A Reader's Respite about the prevalence of reviews about the same books. It got me thinking about my own reading habits in the last year since I first started receiving ARCs. I was a little stunned at how few books I've read that are not ARCs. Just this year alone, of the 20 books I've read 14 of them were either ARCs or offered by the authors. That leaves only 6 books I read just because I wanted to. I will state up front that I have thoroughly enjoyed my reading this year. I am grateful to authors and publishers who are willing to pass along a free book in exchange for an honest critique. I didn't used to read a lot of modern literature. In fact I was a bit of a snob about them. I looked down my noise at modern literature as inferior compared to the old, wise classics. To me, the classics were intelligent and exercised the mind while modern literature was a lot of fluff and hot air, or just repeating poorly what had already been said with style and class. Since joining the book blogging community I have learned a powerful lesson about the value of modern literature. Out of those 20 books read this year only one is older than 4 years old (The Reluctant Dragon is closer to 100.) and only 1 of them did I seriously not like. Most of them I truly loved. I have felt especially lucky with my reading selections this year. But...I miss my classics; I miss the freedom to browse my personal book shelves and read whatever jumps out at me. I have about 500 books(I'm not counting children's books or my husband's), most of which are TBR. I feel as if all those books that I paid money for are going to waste. They look great on the shelf but that's not why I bought them. I want to actually read them and I am not. Today I got a notice in the mail that an ARC that I requested a couple of weeks ago will not be coming my way. I am relieved. It means that once I've read the two ARCs I have and the one that is supposed to be on its way then I'll be able to get into one of my own books. This makes me happy. I'm not done with ARCs and author offerings but I will be a lot more choosy from today on. I think it's time to let my reading be led by my interests. Maybe I'll read everything written by a new-to-me author. Maybe I'll join a challenge again. Maybe I'll just close my eyes and read whichever book my finger touches first. The idea makes me feel free and excited. I know I'm not the only one. Michele has had 40+ comments saying essentially the same thing. Maybe someone should start an Off the Shelves challenge. Anyone willing? 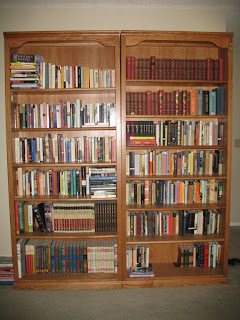 Non-fiction, modern fiction and childrens collections on the left; classics and poetry on the right. I cut back on my ARCs a couple of months ago. I have been lucky in that all of the ones that were sent to me have been pretty good but there are so many that I want to read. The books that I've purchased this year alone could take me well into next year. I read 90% review books...most other books I read are challenge books. I do get a bit stressed out sometimes, but I'm mostly happy. I almost don't know how to pick a book by whim anymore. For what it's worth, I love your challenge idea (off our shelves). I would be the first person to sign up. I'll be trying to finish up the review copies I have right now over the next two months or so. But I picked a book off my shelf (one that I bought over a year ago) and read it....it was so relaxing and felt wonderful to read something because I wanted to! Almost like a weight off my shoulders. I'm so glad there are reviewers like Amy out there...they are so good at what they do and I feel quite comfortable leaving the advance copies in their capable hands! I'm feeling a little overwhelmed lately, too. I've got a small stack of review copies, but I will be spacing them out over the summer and have stopped accepting any new ones (unless I'm really anxious to read them). It's the ones where the publisher asks for the review at a certain time or blog tours that are stressing me out--I've three and after that--no more of those. I still read plenty of my own books, but it's the feeling of obligation--that I should be reading a review copy instead that is a bit of a drag. It seems a lot of us are going through this lately. I've cut back quite a bit on accepting review copies, but there are some I just can't resist. Even with accepting fewer I'm still behind...maybe that means I need to quit accepting any for a while. I've cut back a bit on the book blogs I read just because I don't particularly want to be sold on just new books. I'm all for getting and keeping new authors and there have been some great new books out, but.......it smacks of commerce and not love. Actually I always have been very selective because I am such a slow reader. And being selective has worked to my benefit because I only get the books that I think I'll really like, and I have really liked them. But I think I'll really like the books on my shelves too; that's why I bought them. I've gotten very choosy about ARCs, too (not that I ever had a lot of offers) and haven't accepted any new ones in months. I'm trying to make more headway into my own piles! I'd join your challenge. I have to admit to getting bored by blogs which only review books I've never heard of. I'd love to see more reviews of older books - good luck to you and your challenge! I feel the same way. I am getting bogged down in ARC's and feel like those are the only books I ever get to read anymore. I am longing for the day when I make my own reading schedule and I can review the books that I have sitting on my shelves. There are some really great things I want to get to, but sometimes I feel trapped under my pile of books being sent by publishers.